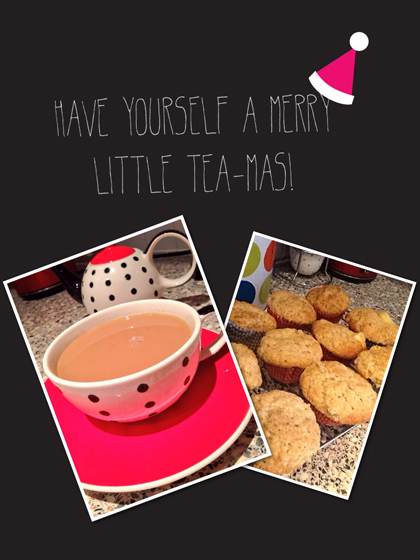 Have Yourself a Merry Little Tea-mas! It’s beginning to look a lot like Tea-mas, everywhere you go! This is my favorite time of year. Yes it might be cold, and yes it gets dark early too, but I find there’s something magical in the weeks leading up to Christmas. Lights begin illuminating the streets, and we start planning how we’re going to decorate our trees. As I’m a British lass, it comes with the territory that I love a cup of tea. But there’s nothing I love more at this time of year than brewing a Christmassy tea to get into the festive spirit. So now is the perfect time to look at some different Christmas teas and how they can be best enjoyed. There are so many different Christmas teas out there, but the key ingredients that will give you that Christmassy feeling is a tea with spices which may include cloves, cinnamon, cardamom and nutmeg and a citrusy base. I’ve seen some more unusual Christmas teas this year too such as Stash’s White Christmas white tea with peppermint and ginger. A particular favorite of mine that gives you that traditional Christmas flavor is Whittard’s Spiced Imperial. It’s available all year round, but it never tastes quite the same as it does in the cold weather. Twining’s Christmas tea is also a great option if you want a festive tea fix in a hurry, when you’re short of time to brew loose leaves. Christmas tea parties, with lashings of tea and Christmas cakes are a great way to enjoy a festive hot beverage with friends. Many tea rooms will hold them across December or you could even host one of your own for a more personal touch. If you’re feeling particularly adventurous why not make your own Christmas tea blend? This way you are able to be creative and try out different combinations to create the exact flavor you desire. A great blend is achieved very easily by choosing a loose tea such as Assam and adding extras like dried orange peel and winter warming spices. Vary the amount you add to get the perfect blend for you – these also make great Christmas presents for the other tea lovers in your life. Whatever you are drinking in the run up to the big day, I’d like to wish you very, merry Tea-mas.